Commissioned exclusively for 40/8 Honor Society of American Veterans Voyageurs. 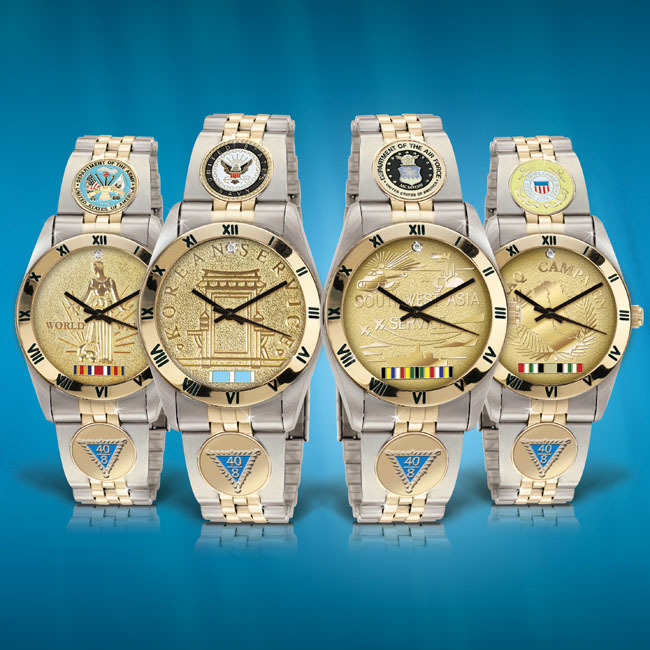 Designed by Veterans Commemoratives™ and produced by Selco of Oklahoma, maker of custom honor watches since 1935. • Your choice of WWII, Korean Service, Vietnam Service, Desert Storm, Iraq or Afghanistan Medal dial minted in high-relief with War Ribbon in Official colors and a genuine diamond set at 12 O’clock. • Your 40/8 Emblem enameled with official colors and choice of Military Service Branch Emblem are set on the unique watch band. • Powered by a precision quartz movement, providing accuracy within seconds per month. • As a final touch of exclusivity the watch case back will be engraved with your initials and years of service. • The water-resistant case and adjustable dress bracelet are both decorated with 24 karat Gold for beauty and durability. • The price is just $125* and may be paid in two convenient, interest-free, monthly installments of $62.50* each. See order form for details. • Your satisfaction is guaranteed 100% or you may return your watch within 30 days for replacement or refund.